In a confusing turn of events surrounding LCD screens in the US, legal authorities have ruled in favour of both Sharp and Samsung in two separate copyright disputes. First, an International Trade Commission (ITC) judge found that Samsung had infringed Sharp's patents on some LCDs and recommended that Samsung imports stop immediately. Fair enough, we thought, but then this week another ITC judgement came down saying that Sharp had violated Samsung's LCD patents in a separate filing. And the recommendation? Yep - no more Sharp imports please. 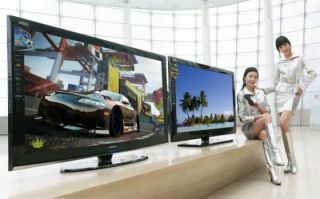 As it stands, however, both companies are continuing to sell their TVs and computer monitors without restriction while the possibilities for appeals are worked out. Ordinary Joe consumers might be puzzled at the legal machinations, but we reckon they'll forget about it all when Sharp and Samsung take the most likely option and settle their differences in private. Now, why couldn't they have done that in the first place?